We had nineteen caterpillars that we brought inside. One caterpillar dies, one chrysalis came to nothing and one butterfly came out but was unable to fly. Three are still to go, one nearly ready. 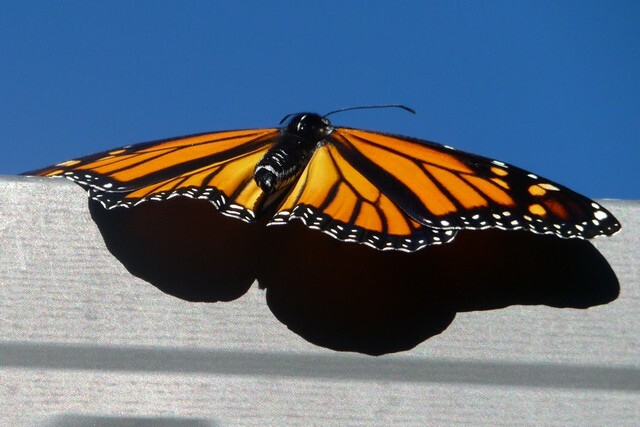 So as of now thirteen Monarch Butterflies released. Sometimes we see one flying around the garden, possibly one we nurtured but you cannot be certain. Apparently they do have an attachment to the place they originated from. To see a tiny caterpillar grow without any help, knowing instinctively to eat, move around with dexterity, to know how to attach its rear to a stork or leaf, curl up and then become encased in a chrysalis shell is mind blowing. Then it gets even more amazing. It breaks out and dries its wigs out before suddenly flying away, without any training on how how to or why it needs to. Then it knows how to find food, mate and find the right bush to lay its eggs on. Truly the embedding of all that knowledge into a pinhead sized brain is a miracle. It speaks of an amazing designer, operating at a level that should make us humble and in awe of the One putting this wisdom and beauty into reality.